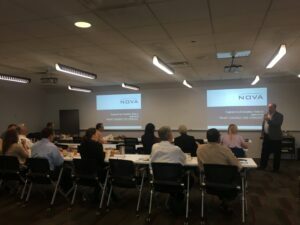 Visited the Stevens & Wilkinson Atlanta office and educated the group on Non-destructive Testing and Forensic engineering. Non-destructive Testing, also called NDT, can detect surface and sub-surface defects without harming your materials and components or affecting their operating performance. Speaker Kurt Heinrichs, Buford office, heads up this department for NOVA.